Developed by the National Strength and Conditioning Association (NSCA) and now in its fourth edition, Essentials of Strength Training and Conditioning is the essential text for strength and conditioning professionals and students. This comprehensive resource, created by 30 expert contributors in the field, explains the key theories, concepts, and scientific principles of strength training and conditioning as well as their direct application to athletic competition and performance. The scope and content of Essentials of Strength Training and Conditioning, Fourth Edition With Web Resource, have been updated to convey the knowledge, skills, and abilities required of a strength and conditioning professional and to address the latest information found on the Certified Strength and Conditioning Specialist (CSCS) exam. The evidence-based approach and unbeatable accuracy of the text make it the primary resource to rely on for CSCS exam preparation. The text is organized to lead readers from theory to program design and practical strategies for administration and management of strength and conditioning facilities. The fourth edition contains the most current research and applications and several new features: - Online videos featuring 21 resistance training exercises demonstrate proper exercise form for classroom and practical use. - Updated research--specifically in the areas of high-intensity interval training, overtraining, agility and speed in changes of direction, nutrition for health and performance, and periodization--helps readers better understand these popular trends in the industry. - A new chapter with instructions and photos presents techniques for exercises using alternative modes and nontraditional implements. - Ten additional tests of maximum power and strength, aerobic capacity, along with new flexibility exercises, resistance training exercises, plyometric exercises, and speed and agility drills help professionals design programs that reflect current guidelines. Key points, chapter objectives, and learning aids including key terms and self-study questions provide a structure to help students and professionals conceptualize the information and reinforce fundamental facts. Application sidebars provide practical application of scientific concepts that can be used by strength and conditioning specialists in real-world settings, making the information immediately relatable and usable. The web resource provides students with lab activities in fillable form for practice and information retention. Further, both students and professionals will benefit from the online videos of 21 foundational exercises that provide visual instruction and reinforce proper technique. Essentials of Strength Training and Conditioning, Fourth Edition, offers an expanded ancillary package for instructors. Instructors receive access to a 61-video collection, including the 21 videos available in the web resource, plus an additional 40 videos demonstrating resistance training exercises, plyometric exercises, and exercises using alternative modes and nontraditional implements, bringing practical content to the classroom. Working along with the instructor guide and presentation package, a test package has been added to assist instructors in evaluating students' understanding of key concepts. 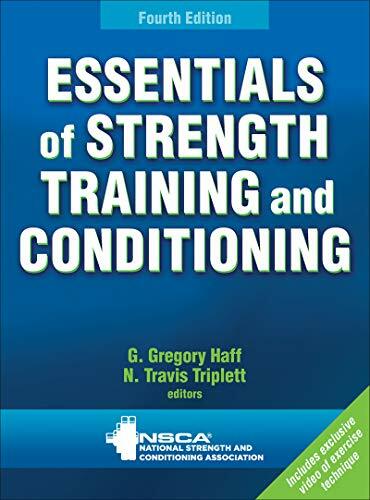 EEssentials of Strength Training and Conditioning, Fourth Edition, provides the most comprehensive information on organization and administration of facilities, testing and evaluation, exercise techniques, training adaptations, program design, and structure and function of body systems. Its scope, precision, and dependability make it the essential preparation text for the CSCS exam as well as a definitive reference for strength and conditioning professionals to consult in their everyday practice.